Today isn't just any Tuesday: It's Indiana Jones Tuesday! That's because Indiana Jones is now on Blu-ray. 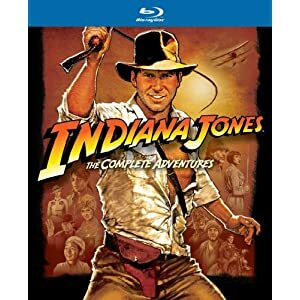 Indiana Jones on Blu-ray Today! I got a look at the new box set at Star Wars Celebration VI last month. In a panel hosted by Pablo Hidalgo, sound guru Ben Burtt, model maker Lorne Petersen, and producer Robert Watts shared some fun stories from the production of the series (and maybe a few digs on Kingdom of the Crystal Skull). A highlight was a sneak peek at some of the behind the scenes footage recorded during the production of Raiders. This unfiltered, no-narration feature looked to be worth the price of the box set alone. Watching Steven Spielberg and team work is a film buff's dream.